1. After the Elite Team Bald Runner finished the 1st Quezon City International Marathon in the middle of October last year, we started planning for our next major road race, the Cebu City Marathon. We immediately transfered our “training camp” to the Sierra Madre Mountains, 70 kilometers east of Metro Manila and bought our plane tickets at least 3 months before our departure from Manila. It was also at that time that I arranged for the accommodation of the whole team at the Officers’ Transient Quarters inside the Central Command Headquarters in Camp Lapulapu, Lahug, Cebu City. With “military” planning, coordination, precision, and support from our corporate-friends/sponsor, the whole team came here to Cebu City well-prepared for the Cebu City Marathon. 2. We attended the Carboaloading Party for the Cebu City Marathon last night in our “black” uniform and arrived first in the venue of the activity. I was amazed with the preparations done by the Cebu Executive Runners Club for the said party. This is a good sign of a well-prepared marathon race. 3. The much-anticipated official and my personal copy of the first Runners’ Magazine in the Philippines, Front Runner Magazine was given to me by Jonel aka Bugobugo85. Not because my picture accupied one of the pages of the magazine, it is about time that a broad magazine ala Runners’ World Magazine & Running Times should be locally published and available to everybody with a cheap price. The maiden issue of the Front Runner Magazine is a MUST for every runner, whether you are a beginner or a competitive runner. Congratulations, Jonel and to your staff for a great job! 4. It was nice to meet John Pages during the Carboloading Party and he was “hands-on” in every part of the program. He made sure that every runner was attended during the party. He stated in his briefing that there are 150 runners from Manila (out of the almost 4,000 runners) who registered for the race and it was heart-warming that he acknowledged the Elite Team Bald Runner. The briefing during the party emphasized that the Gun Start in every distance-race will start ON TIME. 5. Finally, I met Heidi Acuna aka MarathonFoodie, one of the leading runner-bloggers based in Cebu City. She also delivered an insight to all the runners about the Cebu City Marathon and her personal expectations about the race. 6. Our tables which were occupied by the members Elite Team Bald Runner and my staff became the assembly point for the runners coming from Manila. Captain Amado Castro, Jr aka Reinier Pacific stayed with us during the party. Dr Tommy Tan and company from the Fairview Running Club came to our table, too. Jinoe, Quennie, and Luis aka Gingerbread Running of takbo.ph were with us while watching the movie “The Spirit of Marathon”. Mari Javier, George Dolores, J Cu Unjieng, & Odessa Coral—1st BDM 102 Finishers and runners for the 2nd edition BDM were there, too. Jaymie aka The Bull Runner and family were also in the party. 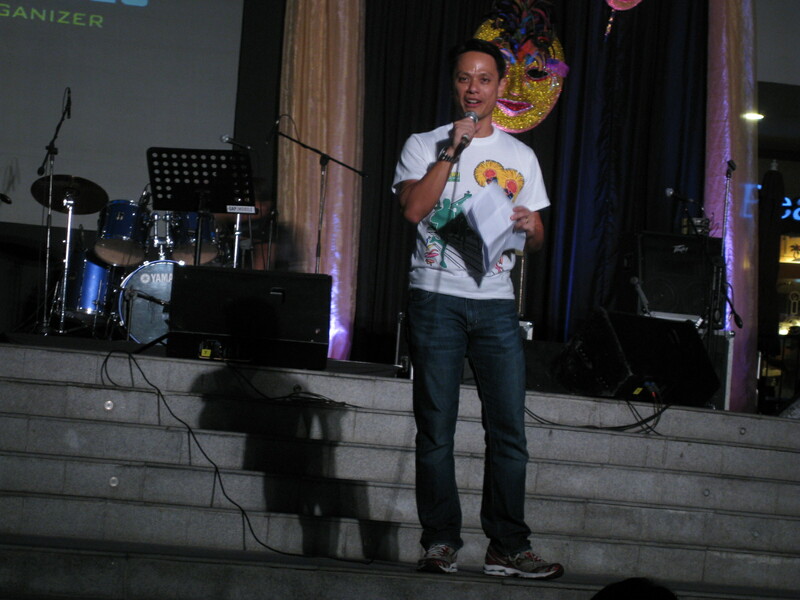 Coach Rio was also one of the speakers during the party as his company/outfit provided the Timing/RFID Chip for the race. 7. I was surprised to see during the party a group of bald runners in one of the tables. I made the initiative to approach them and talk to them. Yes, I think I was able to count 5 or 6 of them and they are part of a running club from Danao City. By their looks alone, they are “hardcores” and competitive runners! I wish them well during the race. This is a good sign that the trademark of Bald Runner has a “chapter or group” in every region or province in the country! 8. For those who approached me and told me that they visit this blogsite on a regular basis, please keep on reading this blog with the hope that every post will be able to inspire you to have an active lifestyle and maintain a positive outlook in life. 9. I had a short and easy run inside Camp Lapulapu this morning. One loop around the camp up to the Tennis Courts/Clubhouse is exactly 1 mile (1.6K). I did 5K in 30:45 minutes with an average pace of 6:09 minutes per kilometer. See you at the Starting Line!!! woooo was supposed to fly there in cebu but the tickets were expensive. will you still be there for sinulog? yes, i’ll be there for sinulog. its been a while since I blogged hopped and ran. 🙂 Here’s to the come back and races! Tuck In Or Tuck Out?